Considering how many Greeks run restaurants in this town, it shouldn’t be so hard to buy compelling Greek food. Open-faced chicken souvlakis and other “Greek” salads built on lettuce – a practice as Greek as chopsticks – don’t count. When I have a hankering for a proper moussaka, a spiced beef and eggplant casserole topped with creamy béchamel, welcoming as a yiayia’s hug, where can I go? To Zoé, on Transit Road, as it turns out. My dinner there had some rough edges, but it took the “eek” out of hunting for Greek. ¶ Zoé is a family restaurant opened in 2011 by Alex Pozantidis and his wife, Sheila. The main dining room, decorated in Mediterranean villa lite, was full when we visited for an early Saturday dinner. We were led through a side door and into a tented patio space, with a view of a muddy parking lot through the tent’s plastic window. It was in the 30s outside the tent, but throughout our meal, a powerful heater clicked on when it got chilly by our table, and made it warm again. 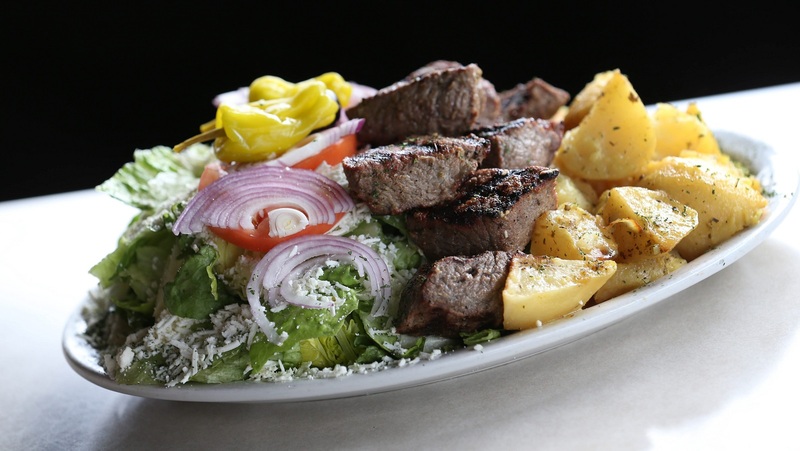 The Zoé menu is typical Greek-American diner – starting with pancakes and eggs and ending in steak, seafood and rice pudding – except it offers an extra helping of Hellenic specialties. There’s saganaki ($8.99), the plate-sized fried Kaseri cheese slice served with lemon wedges, a lamb ragu pasta ($16.99) and gigantes, or butter beans, on special. We asked for the saganaki and more mezes, or appetizers, including bouyourdi ($7.99), feta cheese baked with tomatoes and pickled peppers, and a pikilia platter ($16.99). That featured stuffed grape leaves, olives and four dips: tzatziki (yogurt-cucumber-garlic), tirokafteri (roasted red pepper-cherry pepper-feta), melitzanosalata (eggplant-feta-garlic) and hummus. Copious toasted pita came with them all. The tzatziki met my demanding standards, a rich drained yogurt base, a whack of garlic, hint of dill and touch of cucumber crunch. Tirokafteri balanced roasted pepper sweetness with spicy pickled chile, and the melitzanosalata was earthy. Greek hummus tends to minimalize the tahini, as this did, but it was well-seasoned. The grape leaves, stuffed with mint rice, were firm and lemony. Saganaki is one of the greatest appetizers in Greek or any cuisine, a saucer-sized slice of firm cheese akin to aged provolone, floured and fried and delivered fast so it arrives crusty-oozy. It lets you mainline the thrill of grilled cheese without the bread. Zoé’s hit the spot. Bouyourdi was almost as addictive – crumbled feta, diced fresh tomatoes, chopped pickled chiles and spices tossed in a bowl with olive oil and run under the broiler. It arrived lightly charred on top, which added to its intensity. I want it again with August tomatoes. The entree round was more of a mixed bag. Avgolemono, egg-lemon soup with orzo, was creamy but didn’t taste like fresh lemon, and lacked chicken. Chicken and waffle ($12.99) was three pieces of fried chicken on a Belgian waffle, with maple syrup and whipped butter flavored with honey and pink peppercorns, more of which were sprinkled over the plate. The fine, fluffy waffle was more celebrated than the average fried chicken. A 12-ounce strip steak ($21.99) was a decent piece of beef cooked accurately and crusted up on the grill. Fluffy seasoned rice, cooked with chicken base, and lightly sautéed yellow squash were pleasing sides. Haddock filet ($12.59), cooked in lemon butter, was firm and flaky, simple fish done well. Sides of well-crusted home fries and fresh, crunchy cole slaw pleased their owner. A spanakopita, spinach pie with Greek salad ($8.99), disappointed with limp pastry and undistinguished filling, but it’s hard to make people happy once they’ve had yiayia’s. When we tried to shake up the Greek dressing cruet, the glutinous spice mixture resisted combining. My Greek platter ($16.99) contained Greek potatoes, grape leaves, crusty browned gyro slices, chicken souvlaki, spanakopita, moussaka and pastitsio, a similar casserole that has macaroni instead of eggplant. Plus a dish of tzatziki to jack up the garlic factor, and more toasted pita bread. The moussaka and pastitsio were both enjoyable versions, offered in sampler-sized helpings on the crowded platter. Both featured cinnamon-scented ground beef and a top layer of browned béchamel, and I would return for both as entrees. The chicken souvlaki was disappointing with dry strips of seasoned chicken breast. I should have asked for the beef version, because the crusty, well-marinated hunks that showed up on the beef souvlaki dinner ($16.99) were outstanding. They still had a touch of pink inside, as requested, anchoring a hearty plate with rice and Greek salad. Dessert included a loose rice pudding with a hint of cardamom ($3.39), a baklava with ice cream ($3.99), dusted with cinnamon and powdered sugar, and a decadent slice of candy-bar-topped peanut butter pie, which was the table favorite. The baklava was not crispy and flaky, but solid as cookie dough. Our server was sure-handed and friendly, but working a tough corner where she had to avoid collisions.